A couple Sundays ago I talked about the scientific evidence that our global climate is warming. Here in Illinois the weather outside may still be frightful – this February was one of the coldest on record in this area. But as I said two Sundays ago, weather is local, and it varies with the seasons, and from year to year. Climate is a long-term, global concept. And when you take temperature measurements in many parts of the world, over the course of decades, and analyze the numbers, it is clear that the world as a whole is getting warmer. If we are having an unseasonably cold end to this winter here in Illinois, somewhere else in the world it is unseasonably warm – and the warm spots are outnumbering the cold spots. The ten warmest years on record (since people started keeping temperature records about 150 years ago) have all been since 1998. Most people seem to be in agreement about this. The scientific community overwhelmingly concurs, and even the United States Senate has gone on record acknowledging that our climate is warming. And if that trend is not stopped and turned around, it is possible that we will see rising sea levels, floods, droughts, and larger, more intense storms throughout the world, impacting not only human life, but all living things. Most people agree the climate is warming. What many people still do not agree on is WHY. After all, there is scientific evidence that the earth has gone through cold and warm cycles many times in the past before humans even existed. And many possible factors might contribute to climate change. Some folks say this is just one of those natural cycles – we aren’t the cause of it, and there is little we can do to change it. But again, there is mounting scientific evidence that human activity is the cause of this current warming trend. Today I want to present some of that evidence. The air we breathe is mostly nitrogen (almost 80%), and oxygen (about 20%), and then small quantities of many other gases. Carbon dioxide is less than one-tenth of one percent (about 0.03%). And that, by itself, is not a problem. Carbon dioxide is not poisonous or dangerous at those levels (it can be dangerous at higher concentrations – as the story of Apollo 13 showed). Carbon dioxide has been in the atmosphere for millions of years. In fact, green plants use carbon dioxide from the air to grow. So some carbon dioxide is beneficial. But carbon dioxide has another property that has a big impact on the earth. Just a couple nights ago was another very cold night here where we live. What do you do to stay warm at home when it gets cold outside? Many people put on an extra blanket. Blankets help to keep our own body heat trapped close to us instead of escaping. Carbon dioxide does the same thing in our atmosphere – it allows sunlight to penetrate to the earth’s surface, but then it keeps the heat from escaping. Carbon dioxide helps keep the earth warm. It acts almost like a greenhouse for growing plants. The glass or plastic walls and roof of a greenhouse let sunlight in, but then keep the warmth from escaping. In fact, carbon dioxide is sometimes called a “greenhouse gas” because of this heat-trapping effect. There are other greenhouse gases in the air, but carbon dioxide is the most abundant and one of the most effective. Back in the 1950s, an American scientist named Charles David Keeling developed a way to accurately measure the amount of carbon dioxide in the air. And he started keeping very careful records. His work shows that carbon dioxide levels in the air vary in a regular pattern during the year – they decrease during the summer (as growing plants absorb it) and increase in the winter (as leaves decay and plants go dormant). But the important finding is that carbon dioxide levels have been rising steadily over the past 60 years. Other scientists have found a way to measure the amount of carbon dioxide in the air from many thousands of years ago. They take samples of ice in parts of the world where glaciers have built up for thousands of years. Little pockets of air get trapped in the ice, and we now have the ability to measure the amount of carbon dioxide in those little air bubbles. What they find is that carbon dioxide levels have risen and fallen over the course of hundreds of thousands of years. But when compared to recent measurements, carbon dioxide levels have very quickly risen to levels never before seen in earth’s recent history, and never before experienced by humans. So where is all of this carbon dioxide coming from? Here is where I get to do a little chemistry lesson. When any carbon-containing fuel is burned, it combines with oxygen to release energy (heat and light), but also carbon dioxide. This is true of almost any fuel that we burn for heat or energy: wood, coal, oil, gasoline, propane, natural gas, and others. Most of these are referred to as “fossil fuels” because they are formed over millions of years by the slow decomposition of ancient plants and other living things under heat and pressure in the earth. It doesn’t matter if it is burned in a fireplace or stove, furnace, automobile or truck engine, airplane or train, or electrical power generating plant, it is putting carbon dioxide into the air. And in the last 100 years or so, we have been burning an awful lot of fossil fuel to power our homes, vehicles, and businesses (and churches!). The preponderance of scientific evidence we have today suggests that global climate change is being caused by human activity – burning fossil fuels to produce energy and carbon dioxide. If you read or listen to the news or political debates these days, you know that not everyone is convinced. Many other natural causes have been suggested for a warming climate (increased sun activity, volcanoes, increased methane in the air, etc.). But several studies have been done to try to pinpoint the source of the temperature increase, and they point toward carbon dioxide. If you would like to read more about the research, I have some books that you might find helpful. Others have suggested that all of these scientific studies about global climate change have been fabricated because scientists are under tremendous pressure to publish important research, and this what scientific journals and funding agencies want to hear right now. In other words, it is all a big conspiracy. Yes, there is some error and even some dishonesty in the study of science. But I would argue that it is only a very small portion, and it tends to be self-correcting – other groups will fail to replicate results, and the findings will be made public. There are just too many studies to be a conspiracy. I think a reason that some people find it difficult to accept these ideas is that they call upon us to make changes to the way we live, to our businesses, and to our public policy. There is a great deal of money to be made in continuing to sell and use fossil fuels as we have been doing for a hundred years, and so there are people running for political office who are willing to dismiss climate change as nonsense. And it challenges our worldview – that the earth is a vast, limitless resource for our own use, with no regard for the consequences of what we do. This may be similar to other scientific ideas of the past that met with great resistance. Galileo proposed that the earth is not the center of the universe, but rather revolves around the sun like the other planets in our solar system. This idea was considered heretical by church authorities because it seemed to contradict the Bible. Charles Darwin presented evidence that life on earth – including human life –evolved from other life forms. This idea is still rejected by many believing Christians because they are convinced that God created humans as we now are. Sometimes our religious or political beliefs can keep us from seeing the world as it really is. But as I said two Sundays ago, in order for us to live faithfully in this world, it is important that we understand what is actually happening in our world. 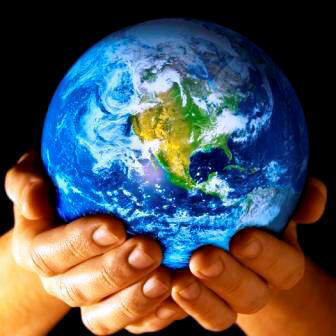 Our Christian faith calls upon us to care for this earth that God has created and given into our care. We are called upon to care for the people whom God loves and who will feel the impact and bear the costs of climate change, even if they played only a small role in causing the changes, or haven’t even been born yet. We are called upon to care for the poor and powerless, and for generations yet to come. What can we do to make a difference? That will be the subject next week. Come back next week and find out! This entry was posted in Sermons on March 12, 2015 by lyonsvillechurch.